It’s finally spring, which means that the long nightmare of Gloom Period has ended at last. 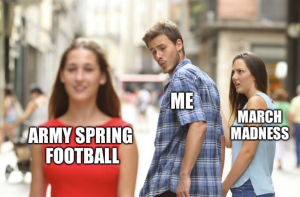 The football team has spring practice, lacrosse is in the midst of their season, and even the baseball team has started playing home games. Collins comes to Army from Saginaw Valley State, where he had a remarkably successful run. Like a lot of Army’s recent hires, he’s got an outstanding resume. This includes both a reputation for being an offensive innovator and noted success getting academic excellence out of his players. Army (-10) vs. Navy sounds about right, but whoever put up Michigan (-6.5) against Ohio State is looking to lose some serious money for the book. Yikes! When was the last time Michigan beat Ohio State? Take Ohio State and the points, time now. Backed by senior goalie AJ Barretto’s career-high 19 saves, the 18th-ranked Army West Point men’s lacrosse team topped Holy Cross 7-6 on the road Saturday. Miles Silva and Nate Jones both had hat tricks in today’s victory. Jones finished with four points. The Army defense caused 10 turnovers and were led by Jones in the effort with two of his own on the ride. This write-up doesn’t exactly do justice to what was an intensely exciting defensive struggle between two very good teams. Both teams were noted for their defense coming in, so it shouldn’t have surprised anyone that we went ten minutes deep into the first quarter before either side scored a goal. Even then points were hard to come by. But the Black Knights fought through to get up by three heading into halftime, only to see the Crusaders come surging back, even the score, and then take the lead in the third quarter. The fourth quarter was ours, however, as Army stormed back to equalize and eventually get up by a goal. After some anxiety producing back-and-forth, Barretto clinched victory with that clutch last-second save, and the day belonged to the Black Knights. This was by far the best I’ve seen Barretto play. Offensive- @YaleLacrosse Freshman Matt Brandau dropped 6 goals and 2 assists in the 16-11 win over Cornell. Defense- @ArmyWP_MLax Aj Barretto was on🔥Saturday with 19 saves in the 7-6 win over Holy Cross. Colgate is coming to Michie this week, and although they stand just 3-3 on the season, they too have a very good team. The Red Raiders own victories over #10 Syracuse and Boston University and have losses to #3 Maryland and Lehigh. Army lost to Lehigh as well, but they also dropped their match against Syracuse. To say the least, the Black Knights will need their best stuff to keep the current run going. The contest starts at noon. Tickets are just $12. I wish I had time to go, but I do not. God willing, I’ll catch at least some of it on the Patriot League Network. 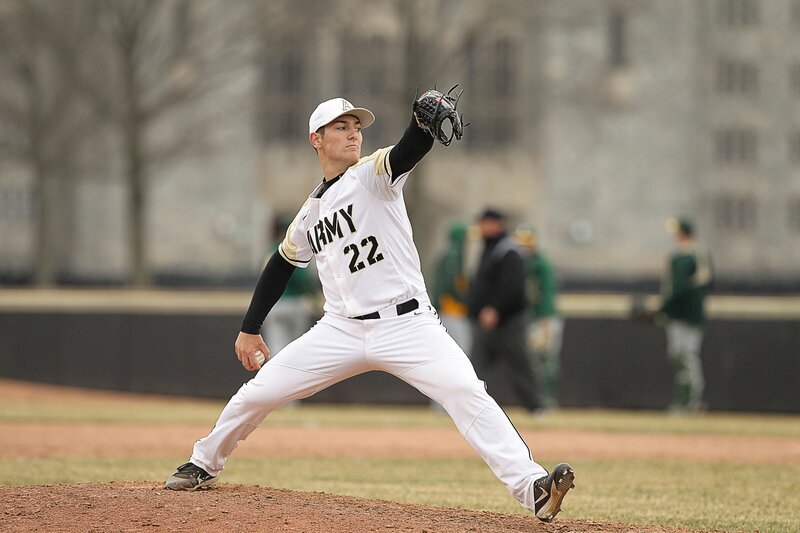 Army Baseball dropped their home opener to Stony Brook on Tuesday, but they came back and laid a whuppin’ on Hofstra Wednesday afternoon. Down 1-0 after Hofsta’s first at-bat, the Black Knights batted all the way through the lineup, scoring five runs in the bottom of the first. They’d chased Hofstra’s starting pitcher from the game by the start of the fourth and owned a 9-1 lead at the end of the fifth. For what it’s worth, Wednesday looked like a nice day to play some baseball out by the Plain. 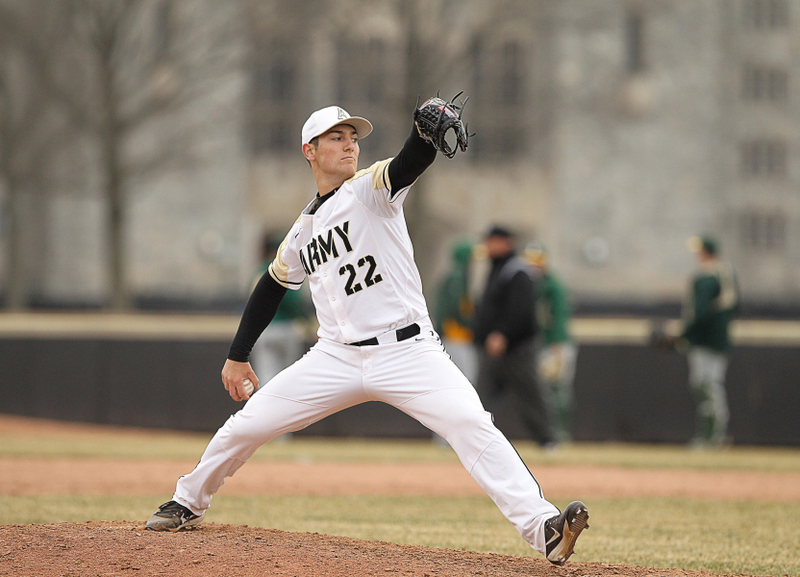 Army opens Patriot League play with a double-header Saturday against Bucknell. They then have their only home game of the Star Series on Sunday. My daughter Hannah really wanted to go to that one, but it looks like we’re gonna try to grab one last day on the slopes before all the snow melts instead. Need a break from all this basketball? The comprehensive deal provides ESPN with rights to all of the AAC’s live programming, except for a small package of basketball games on CBS and some Navy football games on CBS Sports Network. That’s an increase of about $5M/year, but it’s going to move a ton of AAC football and basketball games off cable and onto ESPN+, making the American conference a de facto pay-per-view experience going forward. The good news for fans of the big schools–UCF, Memphis, Houston, maybe USF, etc.–is that some of the American’s marquee games will wind up on ABC. The bad news is that something like Tulane at Temple will almost certainly cost you an over-the-top subscription from now on. Navy won’t get as much of that $5M increase as some of the other schools. There are two reasons for this. First, because the AAC’s deal is comprehensive not just for football, but the squids are in the Patriot League for everything but football. Second, because CBS Sports already owns the broadcast rights to Navy’s home games. Those rights were renewed just last year through 2028. CBS also owns the rights to the Army-Navy Game through 2027. By comparison, CBS Sports owns Army’s home broadcast rights through just 2022. In light of the AAC’s new deal, Army’s shorter term contract suddenly looks a lot more appealing. Birmingham (4-2) and Arizona (3-3) both rebounded, and Orlando (5-1) lost. That puts San Antonio (4-2) in the driver’s seat in the West, and it might also make the rest of the season just a little bit more interesting. Alas, the Saturday games don’t inspire. Orlando is going to destroy Atlanta (2-4), and yeah, maybe Salt Lake (2-4) will make it competitive at San Antonio, but then again, they might not. I’m personally starting to think the Commanders are the best team in the West, and I think they’ll get a statement victory tomorrow night. As usual, the Sunday afternoon game looks to be the best of the weekend. The winner of San Diego (3-3) at Arizona will probably face San Antonio in the playoffs. Both teams know it, and as of last week, they both looked to be rounding into form. That ought to make for some decent football. Sunday night’s game does not appeal. We opened the season with Memphis (1-5) at Birmingham, and the Iron looked unstoppable. Fast forward a few weeks, and now the Express have signed Johnny Football because their season is basically over. Meanwhile, Birmingham still needs to find more consistent offense, or they’re gonna get slaughtered twice more by the Apollos–once in the regular season finale and again in the playoffs the following weekend. Football Outsiders put up a long post about the AAF a few days ago. They mostly came to the same conclusions I did, but there’s some interesting stuff in there about attendance numbers along with a much longer discussion of most of the better teams in the Alliance. They’re a lot higher on the San Diego Fleet than I am, for example. Check that out if you didn’t quite get enough football this week. I enjoyed it.